LAS VEGAS, (October 13, 2018) - Feld Entertainment, Inc. announced that Monster Energy Kawasaki''s Eli Tomac won $1 Million and became the first two-time Monster Energy Cup Champion at Sam Boyd Stadium in Las Vegas. For the first time in the event''s eight-year history, one lucky fan, Jesse Hebert from Greenbelt, Maryland also won a $1 Million Grand Prize after Tomac became the $1 Million winner and third athlete in history to claim the Monster Million. The invite-only, all-star event featured the world''s most elite two-wheeled professionals battling it out for the coveted Monster Energy Cup. "I was just full on, that''s all there was to it," Tomac said on the podium. "It was just wide open; I was making the passes, and then it was just all the way ''til the end. This is just insane. Unbelievable." Monster Energy Kawasaki''s Eli Tomac captured $1 Million on Saturday, October 13 at the Monster Energy Cup at Sam Boyd Stadium. Photo credit: Feld Entertainment, Inc. Unlike any other race, the Monster Energy Cup celebrates Supercross''s rich tradition in Las Vegas by challenging riders with three, 10-Lap Main Events. In the first Main Event, Monster Energy Kawasaki''s Joey Savatgy took the Toyota Holeshot and led the first lap ahead of Tomac, Autotrader/Yoshimura/Suzuki Factory Racing''s Chad Reed, Rockstar Energy Husqvarna Factory Racing''s Jason Anderson and Team Red Bull KTM Factory Racing''s Marvin Musquin. The two Kawasaki''s pulled away until Tomac gained the lead over the kicker into the sand section and grabbed the win. In the second Main Event, Tomac found the lead on the first lap and held onto the win with Musquin in second and Kawasaki''s Joshua Grant finished third. In the third Main Event, Tomac charged from a seventh-place start and passed his way to the front for a stunning comeback that called for a standing ovation. Four of the past seven Monster Energy Cup Champions, including Musquin and Monster Energy/Yamaha Factory Racing''s Justin Barcia and Ryan Villopoto, competed in the event on a hybrid-styled supercross track designed by five-time Monster Energy Supercross Champion, Ricky Carmichael. Anderson and Savatgy rounded out the overall Cup Class podium with a (3-5-4) and (5-6-2), respectively. In the Supermini class, KTM''s Max Vohland dominated both Main Events going (1-1) ahead of KTM''s Kaeden Amerine who finished second with a (3-2) and Kawasaki''s Chance Hymas rounded out the podium with a 5-4. In the Amateur All-Star class, Honda''s Jo Shimoda took the overall win with a (1-3), Husqvarna''s Jalek Swol went (3-2) and KTM''s Derek Drake finished third overall with a (6-1). 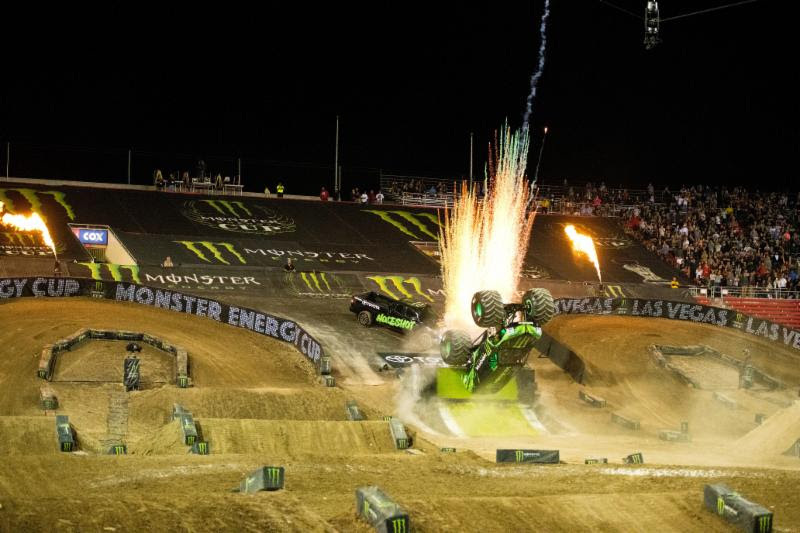 Fans also enjoyed a first-ever backflip on a Monster Energy Cup track from the Monster Energy Monster Jam® driver, Todd LeDuc, a two-time Monster Jam World Finals champion, who landed the flip during intermission. The Monster Energy Cup is an annual showcase of the world''s top Supercross athletes in a one-night-only battle for the coveted Monster Energy Cup trophy and the shot at winning $1 Million, the largest prize in motorcycle racing. Unlike any other race, the Monster Energy Cup challenges racers in their fight for victory with three, 10-Lap Main Events on a custom-designed track, inspired by five-time Monster Energy Supercross Champion Ricky Carmichael. 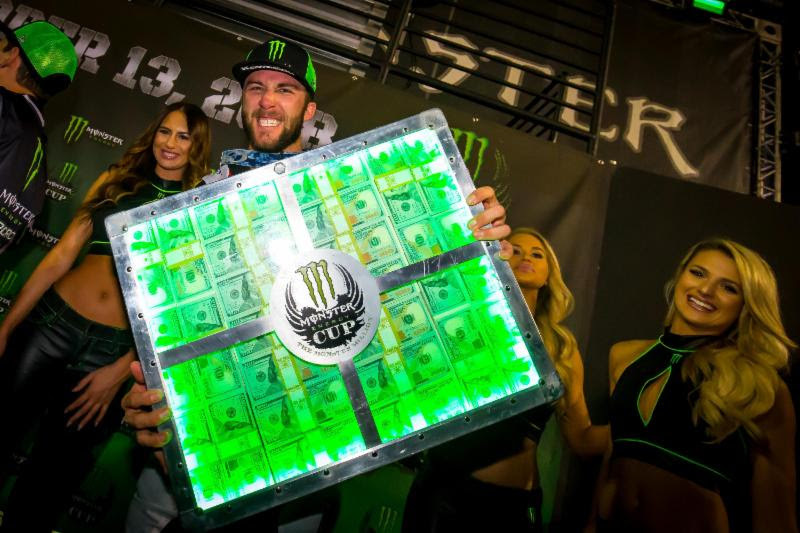 The Monster Energy Cup posts a $250,000 purse, with the winner guaranteed to walk away with a $100,000 check, and any rider who wins all three Main Events will take home $1 Million.